The word “rarebit” is a corruption of “rabbit”. The term “Welsh rabbit” was first used in 1725 and the first recorded reference to “Welsh rarebit” dates back to 1785. The word “rarebit” is never used independently. Despite the name, the dish did not originate in Wales. The English used the word “Welsh” to mean “foreign”. 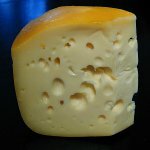 Another theory claims that the dish was distributed to the Welsh because they were considered fond of cheese. Be that as it may, Welsh rarebit is quite a popular dish in the United Kingdom. It is basically a cheese sauce which is served hot in a chafing dish or poured over slices of toasted bread. Welsh rarebit is typically made with Cheddar. Mustard, ale (for instance, porter or stout), Worcestershire sauce, paprika, or cayenne pepper are sometimes added. To celebrate the National Welsh Rarebit Day, try your hand at cooking this dish. There are many recipes on the Internet, and most of them are very easy to cook. Welsh rarebit with toast and sunny-side up eggs will make a perfect breakfast.